Finding a healthy, protein-packed snack that’s not short on flavor is easy — so long as you’re shopping the lineup of premium jerky products lovingly handcrafted at Mahogany Smoked Meats. We have been offering the finest smoked meats available, all from our busy Bishop, Cali. home, since 1922. That’s why our loyal customers only trust us when it comes to buying the best-tasting jerky available anywhere. Our gourmet turkey jerky is made fresh every week in the traditional, old-fashioned way. Every batch of our turkey jerky begins with whole premium cuts of meat. Do you crave something a little more exotic? At Mahogany Smoked Meats, we offer a line of homemade elk, wild boar and buffalo jerky that’s made fresh every week! Finding a healthy, protein-packed snack that’s not short on flavor is easy — so long as you’re shopping the lineup of premium jerky products lovingly handcrafted at Mahogany Smoked Meats. We have been offering the finest smoked meats available, all from our busy Bishop, Cali. home, since 1922. That’s why our loyal customers only trust us when it comes to buying the best-tasting jerky available anywhere. 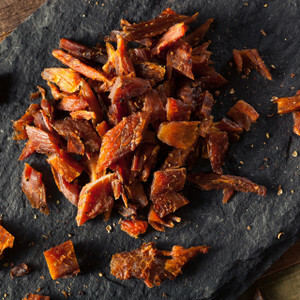 Our smoked jerky products are full of robust flavor thanks to our unique mahogany smoking process. Don’t settle for the bland, mass-produced jerky you find at a convenience store or supermarket. This jerky is made using premium cuts of meat and is loaded with high-quality marinades and seasonings. Order our popular marinated teriyaki beef jerky, western turkey jerky with a hint of saltiness, or peppered wild boar jerky that’s the perfect mix of spicy and sweet. We have dozens of options to make your taste buds sing with pleasure. Furthermore, when we say our smoked jerky is all-natural, we mean it. Mahogany Smoked Meats’ jerky contains no added preservatives or MSG, leaving more room for the flavor and texture you love. 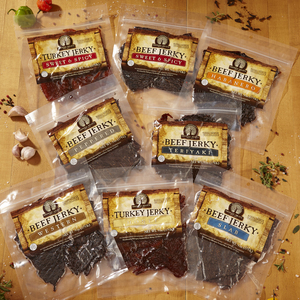 It also has no artificial colors or flavor-enhancers — this truly is jerky made the old-fashioned way! By ordering through our website, you can ditch the cheap-tasting jerky you’ve grown accustomed to and instead enjoy the best jerky you’ve ever eaten. We will pack your order fresh from the latest batch and ship it quickly to your door with a 100 percent satisfaction guarantee. That’s why we’re the best place to buy beef jerky wholesale, along with turkey, elk, buffalo and even fish jerky. You’ll never think of jerky the same way again!